Our last experience with Turkish Airlines on the route Istanbul - Prague, in March 2010, made very good impression from checking till arrival. The C Class Istanbul Atatürk International Airport passengers waiting time is extremely short. There is of course a separate counter, but also a fast track for police and immigration controls. A privilege which allowed us to reach the lounge within less than ten minutes. The 1470 m2 « CIP Lounge» shows how much TK cares about its business and VIP clientele. The hostesses are helpful, smiling and actually charming. The lounge is among the most beautifully designed we have experienced. It is very specious and has a glamourous decoration, mixing large and deep leather sofas with gilded chairs (we should write thrones!) which made us feel like pashas. It was peak time, with many passengers in; there was nevertheless plenty of room to accommodate oneself at ease. The buffet was regularly refilled with fine quality snacks, club sandwiches, sweets for kids, and a wide choice of soft and alcoholic beverages. Excellent expresso coffee. Large selection of daily newspapers and magazines. There is a huge, extremely comfortable Internet corner (WiFi is complimentary also: using you own laptop is easy, with a prompt signal shake-hand). There is a prayers room. Long-haul flyers will like the presence of clean, well designed showers. The washrooms are simply palatial: with precious marble and antique taps! All the marvels of the Orient are concentrated in this «CIP Lounge», which is well worth five star, as it actually reflects the atmosphere of a palace hotel! No priority boarding, and a transfer by bus to the plane: this could be improved. Our Boeing 737-800 was brand new. Comfortable, with leather seats in both C and Y classes. The size of the C class is variable; separated from the Y class by a simple curtain. The service aboard was warm and anticipating. A refreshment was served before the smooth taking off. Only two passengers per row made the cabin intimate and cool. The seats are quite large, though they would gain in comfort if a few inches deeper. The pitch is more than acceptable. Pleasant isolation and temperature aboard. No movie was played (this was a short 2 hours flight). Newspapers distributed aboard are mostly Turkish. So just think about bringing an interesting book, or to collect some magazines from the lounge. 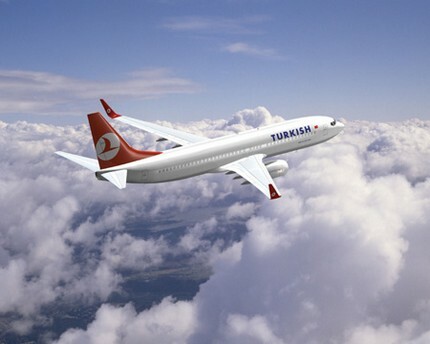 Turkish Airlines is actually recommendable. See here our second in-flight test, featuring TK long-haul C Class.